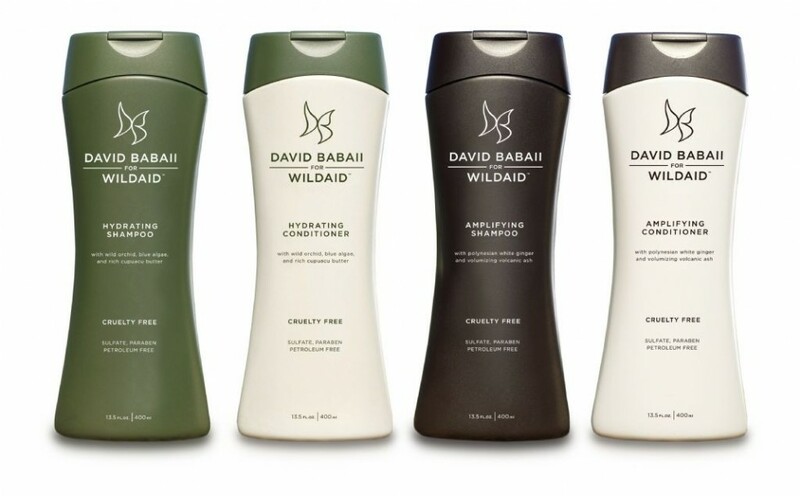 David Babaii for WildAid was created with the partnership of actress Kate Hudson and her celebrity hairstylist David Babaii to help raise awareness and funds for endangered animals. The organization WildAid was the recipient of the brands success which added to the importance of the cause. The products were all eco-friendly and cruelty free using exotic ingredients with the concept of not only saving animals but the planet.Janice McCafferty Public Relations was secured to launch the brand world-wide. David Babaii for WildAid was created with the partnership of Actress Kate Hudson and her celebrity hairstylist David Babaii to help raise awareness and funds for endangered animals. The organization WildAid was the recipient of the brands success which added to the importance of the cause. The products were all eco-friendly and cruelty free using exotic ingredients with the concept of not only saving animals but the planet. Janice McCafferty Public Relations was secured to launch the brand world-wide. Janice McCafferty herself was personally secured as the Director of Communications for the brand. Prior to the initial launch, Janice McCafferty prepared written copy for each product, directions and proper cruelty free and environmental labels. Janice McCafferty Public Relations assisted marketing with retail presentations including HSN, Sally Beauty Supply, Walgreens, Rite Aid and Ulta along with trend reports and photo shoots. Janice McCafferty Public Relations helped to coordinate retail promotions and store opening ideas such as “Shampoo Parties”, “David Babaii for WildAid and Bride Wars”, “National Wildlife Day”, “David Babaii for WildAid Embraces Earth Day” and “Aspen Fashion Week”. The initial launch was held in New York with Kate Hudson and David Babaii in attendance and beauty editors from ALLURE, AMERICAN SALON, AMERICAN SPA, ANTENNA, BEAUTY BLITZ,BEAUTY STORE BUSINESS, COOKIE, COSMOgirl, Cosmo Radio, COSMOPOLITAN, DOMINO, ELLE, EVERYDAY WITH RACHAEL RAY, FAMILY CIRCLE, GLAMOUR, GOOD HOUSEKEEPING, HAIR COLOR & DESIGN, HARPER’S BAZAAR, HARRIS PUBLICATIONS, HEALTH, INSTYLE, LATINA, BEAUTY LAUNCHPAD, LUCKY, MARIE CLAIRE, MARTHA STEWART, MEN’S FITNESS, MEN’S HEALTH, MODERN SALON, NEW YORK MAGAZINE, NYLON, OPRAH MAGAZINE, ORGANIC SPA MAGAZINE, OUT MAGAZINE, PEOPLE, PEOPLE EN ESPANOL, REAL SIMPLE, REDBOOK, REDBOOK, SALON CITY, SALON MAGAZINE, SALON PLUS, SELF,SEVENTEEN, SHAPE, SOPHISTICATE’S HAIRSTYLE GUIDE, STYLE.com, TEEN VOGUE, THE DAILY, THE VIEW, TOWN & COUNTRY, USA TODAY, VANITY FAIR, VIBRA, VOGUE, VOGUE JAPAN and WALL STREET JOURNAL. After the launch in New York another launch party was held in Toronto, Canada with Kate Hudson and David Babaii in attendance generated the following press in attendance: 2 Magazine, Argyle/Lush, B Magazine, Beauty Beat and Spa, Beauty Boutique, Beautynet.com, Canada AM, Canadian Hairdresser, Canadian Living, Canadian Press, Chatelaine, CHUM, Cosmetics Magazine, Elevate Magazine, Elle Canada, Elle Quebec, Esthemag Pro/Spa Media,Inc, ET Canada, Etalk, Fashion Magazine, Flare, FQ, Toronto Star, FT, THE HEAT, Global, Globe and Mail, Glow, Hello!, Hermes, InStyle, Lou Lou, More Canada, MTV, National Post, Rexall Pharma Plus, Salon Magazine, Shoppers Drug Mart, Style Magazine, Sweetspot.ca, Toronto Life, Toronto Star, Toronto Sun, TSC, Vibra, Wedding Bells, Wish and Zoomer. The Canadian launch party also included Kate Hudson and David Babaii invited to announce the product line at a Virgin Airlines party hosted by Sir Richard Branson. Janice McCafferty Public Relations achieved an overwhelming amount of press coverage through print, on-line, radio and television. An exclusive story release in Vogue spear-headed the press followed by every major publication covering the story and featuring the products. This included not only conventional press but extended to eco-friendly/green and anti-cruelty outlets. The brand crossed over to many outlets, securing daily press coverage that was distributed to all sales and retailers. We also utilized David Babaii’s celebrity hairstylist status with all the major award shows, style how to’s and beauty tips to be shared by consumers around the world. In fact, the PR Director of Rite Aid credited Janice McCafferty Public Relations with securing the most press coverage she has ever seen for a brand. Our agency also secured an agreement with PETA. The brand won several awards such as a Self Healthy Beauty Award, Natural Health Beauty Award, Teen Vogue Beauty Award, InStyle Beauty Award, ELLE Green Award, Allure Best of Beauty Award, Beauty Insider Choice Finalist CEW.